I have often passed through Linlithgow on the train when travelling from Glasgow to Edinburgh and decided that it was time to stop at this historic town to visit the birthplace of Mary Queen of Scots in Linlithgow Palace. This impressive building can be seen as the train approaches the station and it is only a short walk from there to the palace. The palace is now a ruin, but is still worth visiting because of its historical significance. It is managed by Historic Scotland, a government body. At the height of its splendour, the palace was one of the finest in Europe. The modern main entrance was built for King James V around 1535 and gave access to the ‘peel’ or outer enclosure surrounding the palace. 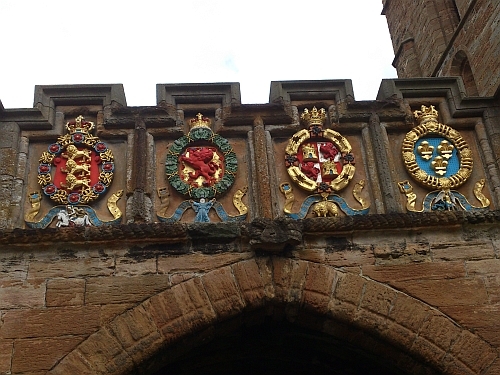 Above the arch are carved the arms of the four European Orders of Chivalry to which James V belonged: the Garter, bestowed by his uncle Henry VIII of England, the Thistle, which James himself founded, the Golden Fleece, given him by the Emperor Charles V and St Michael by Francis I of France. 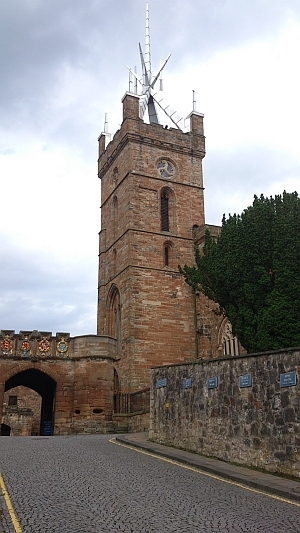 Next to the entrance is St Michael's Church, which was used as a place of worship by Scottish Kings and Queens. Mary Queen of Scots was baptised there. The aluminium crown at the top of the tower was built in 1964 and represents the crown of thorns placed on the head of Christ by the Roman soldiers just before his crucifixion. The palace is completely enclosed and it must have been a magnificent sight when in use. 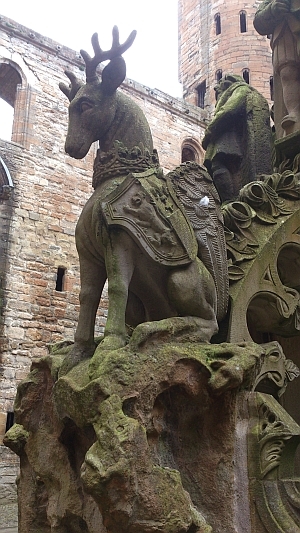 In the courtyard is a fountain which was built by James V around 1538. It is in tiers, with a crown at the top representing the king's superiority. 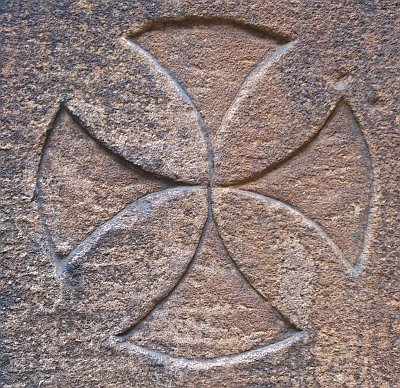 A Christian Cross sits on top of the crown to represent the authority of God. On some days the fountain is fully functioning, but on my visit it was turned off. The east side is the oldest of the four sides of the palace and dates from1430. The main entrance was originally on this side. The Great Hall is situated in this part of the palace. The Great hall had one of the finest interiors in Scotland. This is where large banquets would be held, as well as sittings of parliament. 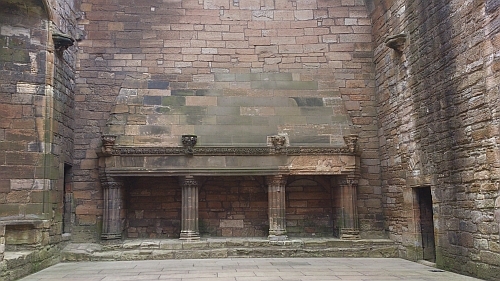 It is a very large room and has a magnificent fireplace which was added in 1500 by James IV. This fireplace has three compartments which could accommodate a large tree trunk. 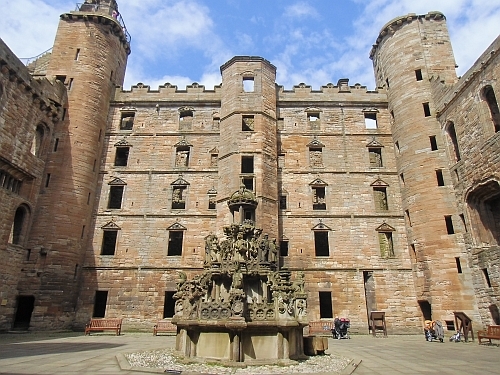 The apartments, situated in the west side of the palace, were built in the reign of James IV in around 1500 and conisist of a king's hall, king's presence chamber and king's bedchamber. 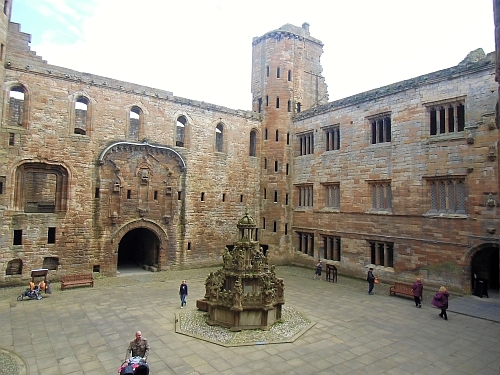 Both Mary Queen of Scots and her father James V were born in the Royal Apartments in Linlithgow Palace. 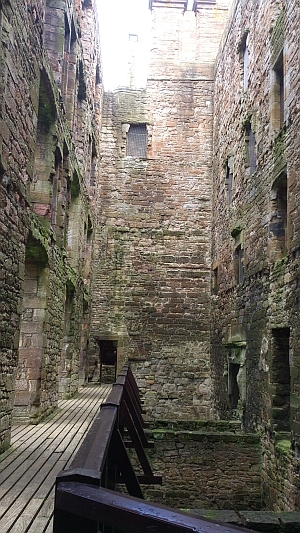 The king's hall was the largest room where the king could meet his subjects and contained few furnishings. The presence chamber was where the king could meet his guests. More important people would meet the king in the presence chamber. The king's bedchamber was the most important room and only close friends would have access to this room. The king's strongroom was also in his bedchamber and was accessed by a small hatch on the floor. 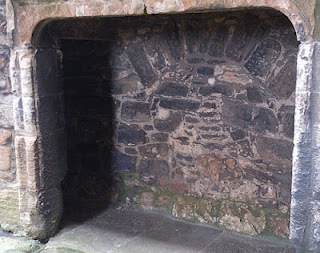 The fireplace in the bedchamber is unusual as it has a small closet where the king could sit to get warmed up. 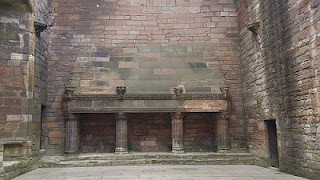 It also was used as a hiding place if the palace was invaded. To avoid suffocation, it was well ventilated. This dates from the 1620's in the reign of James VI after the previous one collapsed. It had four floors and comprised mainly of living accommodation, except for the first floor which had the long gallery or principal room. 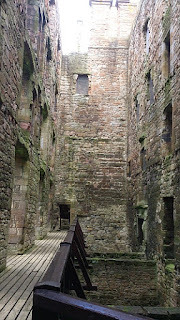 A basement was at the bottom and the rest of the north range was used as accommodation for courtiers and officials of the royal household. In total there were 14 two-roomed suites and 39 fireplaces. 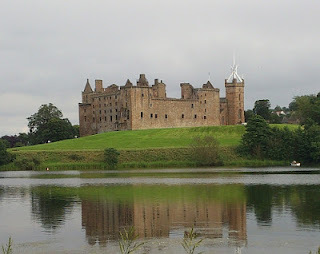 From the north range there are good views of Linlithgow Loch. In 1746 a fire started in the north range and quickly spread to the whole palace. 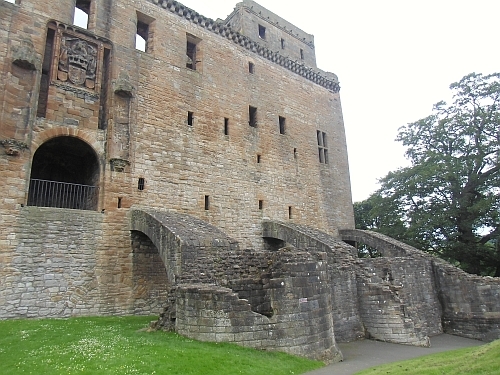 At the corners of each of the areas of the castle are towers reached by turnpike stairs. Only one is open to the public, Queen Margaret's Bower. 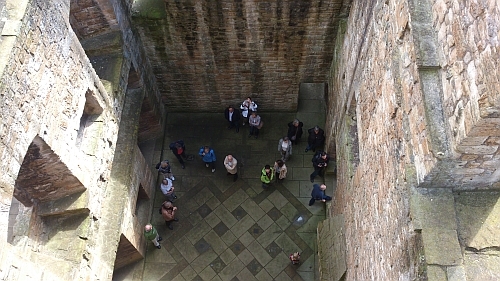 At the top of this tower, situated between the west and north range, is a small chamber with wall seats. Queen Margaret sat there in the autumn of 1513 to await the return of her husband, James IV, from Flodden where the Scots were fighting the English. Sadly her husband never returned, having being killed in battle. 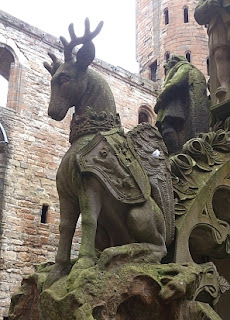 The Stewart Kings believed in 'devine right' ie their powers conferred by God. The small chapel was built by James IV around 1492 and about the only clues that the room was used as a chapel are small crossed carved into the wall. There are six visible now, although there probably were more. These were used for storage and for stabling the horses. The guardsroom was also and there was a small underground prison with no light of ventilation. Children were lowered into the prison in a basket, women were lowered on a rope and the men were thrown down into the prison. As it was quite a distance from the ground, many men must have suffered broken bones. The original entrance was on the east side and it can be seen above. There was a drawbridge into the palace and above the entrance were the royal arms flanked by a pair of angels. The long slots to the fight of the entrance held the beams from which the drawbridge was suspended. 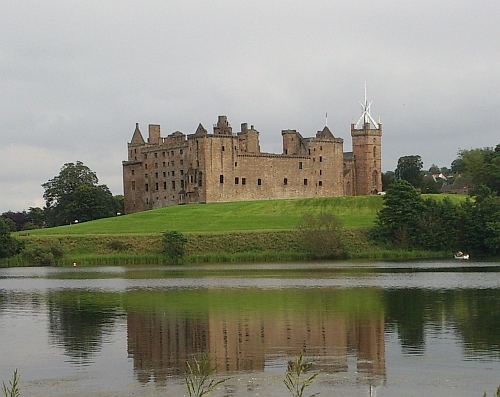 The palace overlooks Linlithgow Loch and is an important area for wildlife and plants. It was formed in the last Ice Age when a large piece of ice from a glacier was left in the land which caused a depression when it melted. Daubenton's Bats feed on the loch at night. The loch is also home to many waterfowl including great crested grebes and mute swans. The walk around the loch is 2.5 miles and gives good views of the north range and royal apartments from a distance. 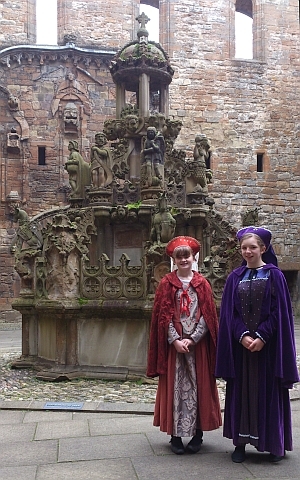 Costumed junior guides are available to take visitors round the palace. 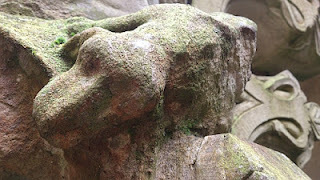 There is so much to see inside the palace and it is possible to spend 2-3 hours there and another hour walking around the Loch outside the palace. 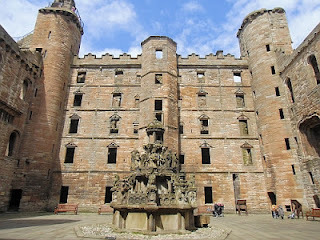 The history of Linlithgow Palace is fascinating and a visit to the palace gives a better understanding of it.